Piyush Goyal has been appointed as interim Finance Minister till Arun Jaitley is able to resume his work as Minister of Finance and Minister of Corporate Affairs. ‘During the period of the indisposition of Arun Jaitley, the portfolios of Minister of Finance and Minister of Corporate Affairs will be temporarily held by Piyush Goyal in addition to his existing portfolios’- agencies reported. Arun Jaitley will be designated as Minister without portfolio during the period of his indisposition or till such time he is able to resume his work as Minister of Finance and Minister of Corporate Affairs. With just about a week left for the presentation of the Vote on Account on February 1, Mr. Goyal’s appointment as the Finance Minister makes it extremely likely that he will present it. Mr. Jaitley is currently in the U.S. for medical treatment, according to the Ministry of Finance, which declined to comment on rumors that he had contracted cancer of the soft tissues in the thighs. “Further, as advised by the Prime Minister, Shri Arun Jaitley be designated as Minister without portfolio during the period of his indisposition or till such time he is able to resume his work as Minister of Finance and Minister of Corporate Affairs,” the statement further said. ‘The President of India, as advised by the prime minister, hereby directed that during the period of indisposition of Arun Jaitley, the portfolios of minister of finance and minister of corporate affairs held by him, be temporarily assigned to Shri Piyush Goyal, in add addition to his existing portfolios,’ Rashtrapati Bhavan said in a release late on Wednesday. PTI, quoting sources, said Jaitley, who had left for the US on January 13, has undergone tests for soft tissue cancer. This is the second time Goyal has been assigned the finance ministry. He had held an interim charge when Jaitley underwent a kidney transplant in May 2018. 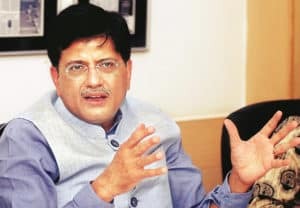 Goyal had in his first stint as interim finance minister announced Project Sashakt, a five-pronged strategy to deal with the bad loan burden of state-owned banks. The interim budget is expected to include measures to address agrarian stress and possibly tax concessions for the salaried class ahead of the general election.